Founder Shana Martin conceived of Club Cat after years of struggling to find appealing cat care options when she traveled for business or pleasure. "Cats don't necessarily require the level of care that dogs do, but recent studies show that they prefer human interaction and actually need it to thrive." One of the many distinctions that separates Club Cat from more traditional boarding options is that pet parents can watch their cats anytime, anywhere from an app on their iPhone or Android phones. "Each of our suites has a state-of-the-art webcam so that cat parents can get their kitty cat fix in real-time," says Martin. Suite size is also a significant departure from traditional cat boarding facilities that kennel cats in cages. 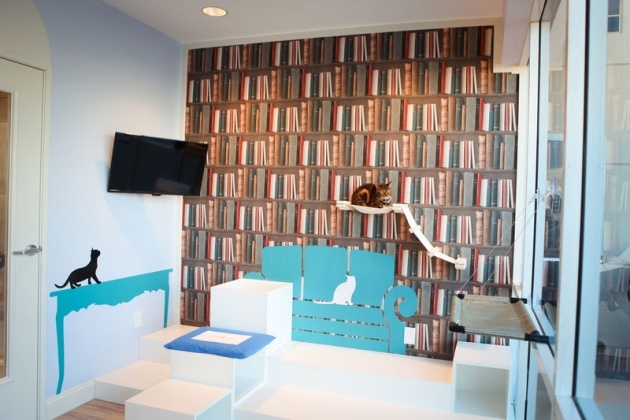 Club Cat patrons will stay in spacious eight-feet tall suites with actual walls and a glass door. Standard suites house up to two cats from the same family; deluxe suites are even larger and can easily fit up to three cats from the same family. Each suite comes with wrought iron beds, multiple levels to perch on, and enclosed balconies.